I've been to Graze at Rochester few months ago for an office function and very much enjoyed their dinner set menu. I've also heard that they had a good brunch/ lunch menu, so I suggested my husband and I pay a visit one weekend. We started out with a salad - Blue Cheese, Poached Pear, Rocket, and Beetroot Salad (SGD 17.00). This salad was my favorite part of this visit. It was fresh, tasty, and the different elements really went well together. I am not a big fan of vegetables, but I was almost licking off the plate after we finished! We ordered off their barbecue menu instead of their regular brunch menu. 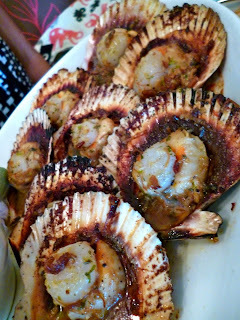 I had the Atlantic Scallops (SGD 33.00) while my husband ordered the Black Cod Cutlet (SGD 40.00). The presentation was good and the serving size was generous. However sad to say that both dishes were not very impressive, and did not live up to the wonderful salad we had beforehand. The scallops were not that fresh, though the XO butter was quite tasty. The cod came with a chili coating which sort of overpowered the taste of the cod itself. 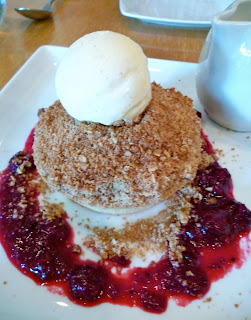 We ended the meal with a Warm Apple Pie Crumble (SGD 17.00). It was delicious! It had a blackcurrant compote on the side. The tanginess of the sauce combined perfectly with the sweet apple pie and vanilla ice cream. The salad and dessert were the best parts of our meal. Unfortunately, the barbecue main course was a little disappointing. I enjoyed their dinner menu much better during my last trip, so we will probably come back next time for dinner instead.